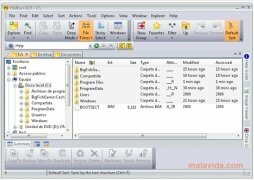 FileBoss is a file manager developed to handle thousands of files simultaneously, to delete documents that you don't want, create backups of those things that are important or change the properties from several folders very quickly. The program's interface, that can be customized by means of skins, it is similar to the Windows Explorer, with the difference that this development has many more menus, two independent browsing windows and at first glance offers much more information about each of the files. 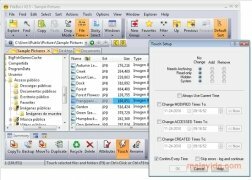 The application allows you to move around each of the folders of your system, copy, cut, duplicate, eliminate and edit the properties of any file, order the files by dozens of different properties and create lists that describe the contents of any folder. 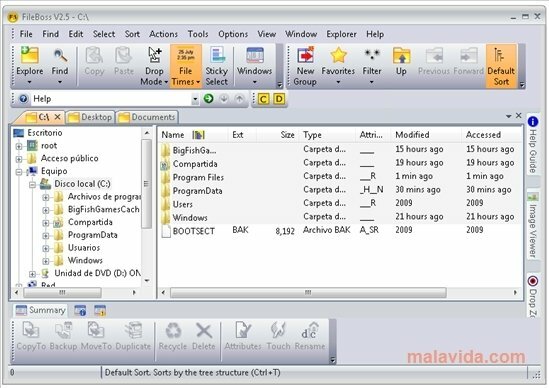 The program also has several utilities that will help you to make the most of the space of your hard drive, such as a process to delete empty folders or a tool with which you can remove all your duplicated files. Discover a great application to easily manage all kinds of files, thanks to FileBoss.